Matsushita is demonstrating it's porter robot; at 130 cm in height and 60 cm wide, it is able to carry about 20 kilograms of cargo. 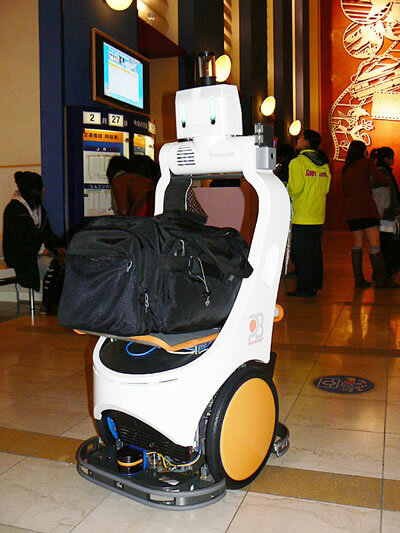 The cool thing about this robot is that the user carries a small transponder that tells the porter robot where its user is at all times. The porter robot lets you place your baggage on its shelf, and then will follow you where ever you go. The robot detects user's position by the supersonic wave, and knows the shape and distance of obstacle by infrared ray sensor and supersonic wave sensor. The robot calculates the best motion in environment, so the robot can follow safely without losing sight of user. The porter robot has an omnidirectional camera and other sensors for measuring range, determining the best way around obstacles, and collision avoidance. The nickel hydride batter provides about an hour of use. Regular technovelgy readers know of my fascination with the autoporter robot from John Brunner's wonderful 1975 novel Shockwave Rider. It won't be long before you'll be able to rent something like this at any airport. Via RobotWatch; the site also has some videos you can download showing the porter robot in action.